On the left is a picture photo of the right side of my neck with molluscum contagiosum bumps all over. This photo was taken exactly one week before I applied Natural Molluscum to the bumps and got rid of them once and for all. At this point in time, I had the molluscum for about eight months. I had tried several kinds of treatments, but nothing cured the disease. Liquid nitrogen was best at eliminating some of the bumps, but it did not cure them for good or stop the spreading. Also, it left a scar. In the photo, the area inside the green circle was treated with liquid nitrogen on 2 separate occasions, 2 weeks apart. 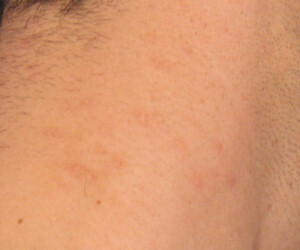 You can see the skin discoloration due to the scars left by the treatment. I had also tried duct tape, iodine, various creams, antibiotics, cortisone, burning, squeezing, scraping, salts, and silver to name a few. Nothing worked. I had warts on my fingers a few years ago, and they cleared on their own within 3 months. But molluscum contagiosum turned out to be much more persistent. Even after eight months, they showed no signs of weakening and were still spreading. The spread from the back of my neck into my hair, to the shaving area on the front of my neck and chin, to my back, and to my shoulders. 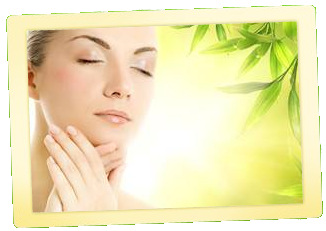 Finally, after weeks of constantly searching for a treatment, I was told of one possibility which worked like magic. After one treatment only, the molluscum bumps started fading away. Since then, I have advised many people about this treatment and it cured every one of their molluscum contagiosum infection. This is the only guaranteed treatment available out there. Trust me, I have done my research and trials. Natural Molluscum really works! 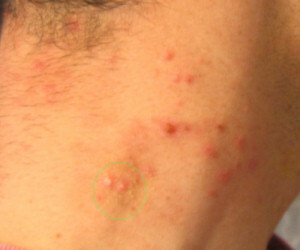 This photo shows the molluscum contagiosum bumps three days after the treatment is applied. If you compare it to the before photo, you will notice that the bumps are all red now and lost the white part in the center. This is a good indication that the virus has been killed. Also, the swelling of the bumps has been reduced significantly after just 3 days. You can still feel the swell of each bump, but it is much less than before. On the lower part of the photo (inside the green circle) are two bumps that were not treated yet. Instead, they were treated for 3 consecutive days with iodine. Four days later, this picture was taken. As you can see, the iodine had no effect. The same night as this photo was taken, those two bumps were treated using Natural Molluscum, and that turned out to be much more effective than iodine. At this point, there were still active lesions on other parts of the neck (including the shaving area in the front under my chin). They were not treated at the same time as the bumps in the photo above, but rather a few days later after I determined that the treatment actually works. 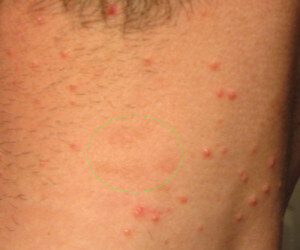 In this photo, you can see the molluscum contagiosum bumps seven days after the treatment is applied. The swelling of the bumps has almost gone and they are almost flat at this point. The two connected bumps on the lower left still has some swelling because those two were treated three days after the others. All the bumps are still red though, but the redness is fading more and more every day. But the swelling is mostly gone. 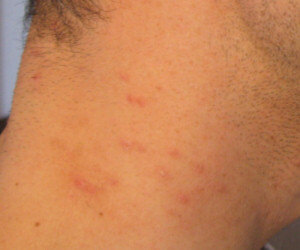 Eleven days after the treatment, and most of the bumps had faded away. There is no longer a redness of the skin, but rather a slight coloration of the skin caused by what used to be the bumps. The coloration faded more and more every day. The skin was smooth with no swelling at all. Two weeks after this photo, it was hard to detect any traces. The skin was back to normal. No bumps. No scars. No molluscum contagiosum.